You only get the most complex customization of your character if you shell out money for a premium account in the free to play incarnation of APB: All Points Bulletin. 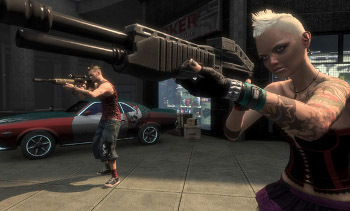 One of the many things that GamersFirst said they liked about APB when it acquired the license to the game from the now defunct Realtime Worlds was the immense amount of character and vehicle customization. Unfortunately, Bjorn Book-Larsson believes that free players downloading all of that content and logging into the game with such complex characters will clog up the servers and make the game less profitable and less fun for everyone. The proposed solution is not to limit the amount that you can change for free players, but instead limit what other people in the game will see. You will only see the really crazy stuff on those characters whose players dropped the cash for a premium account. The good news is that your account status is only checked at the time of customization, so even if your premium account lapses, people will still see all your bling. "The customization system [of APB] can generate incredibly complex objects that at runtime get pushed to all the other players in a session, which means that the more complex the customization, the more stuff has to be pushed to everyone in a particular game," Book-Larsson said on the APB Reloaded blog. "Instead of limiting what you can customize as a free player, you will be allowed to customize almost anything, but you will not be able to store (and share) complex customizations above a certain complexity level unless you are a premium player," he said. "It would also let you be premium for just one month, create a lot of customizations that month, and then use those items later on (even if your premium membership has lapsed.)" It's an interesting way of limiting server traffic while also keeping the illusion that your character looks super-mega-cool. If you keep playing for free, your cop or will just look so-so to those around you, but it will always look awesome to you. There is still no word on how GamersFirst will honor old subscriptions for APB, but there were hints that such accounts would be grandfathered in as premium accounts for a short amount of time.